Formed in 1986, the Empire State Youth Jazz Ensemble is comprised of outstanding high school jazz musicians from throughout the Capital Region. Repertoire for the ensemble covers most of the history of jazz from early swing of the 1920s to today's contemporary jazz. The ensemble routinely performs at The College of Saint Rose’s new Massry Center for the Arts. In March 2005 the Ensemble was paired with the Eastman Jazz Ensemble in a concert at the NY State Band Directors Association (NYSBDA) Conference in Syracuse. As part of the ESYO organization (Empire State Youth Orchestra, Inc.), the ensemble participates in all-ESYO performances including ESYO’s annual Playathon at Crossgates Mall. From time to time, this ensemble also shares the program with ESYO’s Youth Orchestra and has performed at Ozawa Hall at Tanglewood. The ensemble has worked with such well-known guest artists as “Blue” Lou Marini and Allen Vizzutti. In 2008, the ensemble premiered Bill Cunliffe’s O.C., commissioned by ESYO for its New Music Festival. Empire State Repertory Jazz Ensemble is another example of ESYO responding to the needs of young musicians. Started in 2006, the ensemble provides middle- and high-school players with an opportunity to improve their jazz ensemble and solo improvisational skills though a repertoire covering the history of jazz – the early swing of the 1920s to today's contemporary jazz. 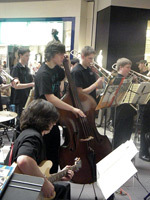 As one of the nine performing ensembles under the umbrella of the Empire State Youth Orchestra, Inc. (ESYO), this ensemble performs at the Massry Center for the Arts in addition to other venues in the region and participates in all-ESYO performances including ESYO’s annual Playathon at Crossgates Mall. Guest artists have included Mike Davis and Mark Vinci, whose piece, Release the Sunshine, was commissioned by ESYO and premiered by the ensemble in ESYO’s 2008 New Music Festival.